Painter to the courts of both Louis XIV and Louis XV, Rigaud was the favorite portraitist of royalty and nobility during the late seventeenth and early eighteenth century. Extremely prolific, he executed hundreds of portraits of nobles, diplomats, military leaders, and monarchs, including a famous full-length likeness of Louis XIV, now at Versailles. The subject of the Worcester picture, Charles-Auguste d'Allonville, held numerous titles, including Head of the House of Philip V, the first Bourbon king of Spain. In 1708, the year the marquis was married, Rigaud painted pendant portraits- this painting and one of the nobleman's wife (still in a private collection)- probably in commemoration of their wedding. 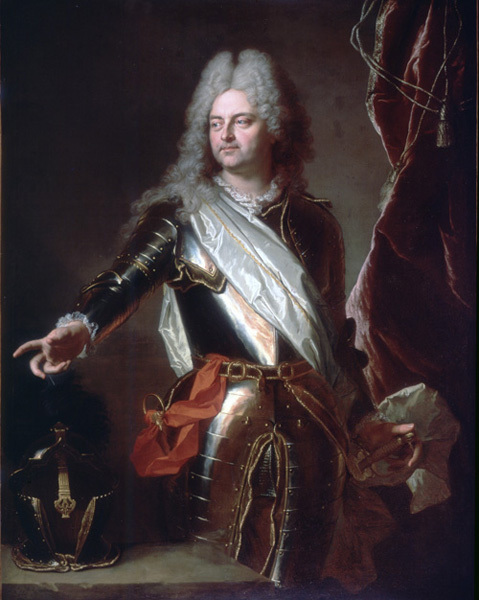 As in most of Rigaud's portraits, the emphasis is on the subject's social rank, here conveyed by the commanding pose and elaborate costume.